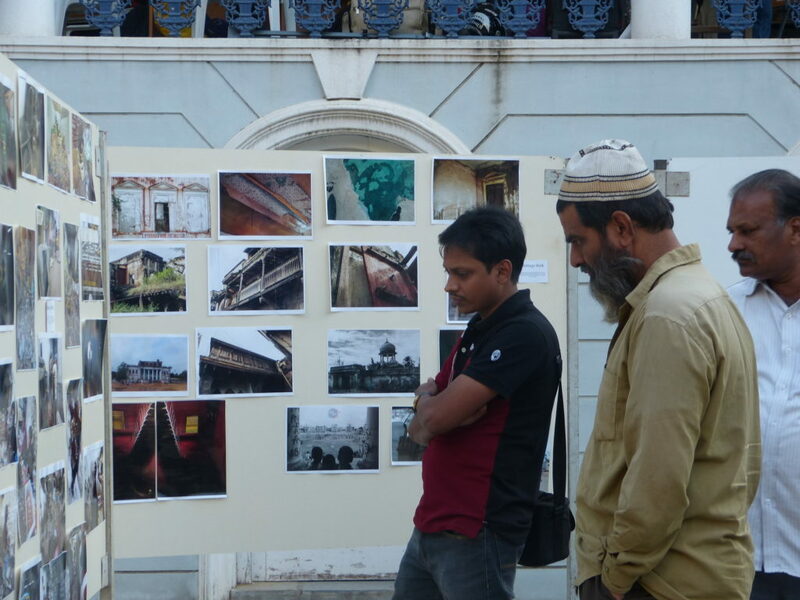 In mid 2013, when Hyderabad Urban Lab was a fledgling urban research programme, some of us based in Hyderabad got together to discuss the possibility of organising an urban event that would truly reflect the diversity of life in our cities. The immediate impulse for this came from a vague dissatisfaction with the disconnect between technology and social life. People seemed to equate technology with multi-storeyed buildings with glass and steel facades. In Hyderabad this wafer-thin understanding of technology seemed to be centred in the Western side of the city – by then known as Cyberabad. Our freewheeling discussions involving artists, activists, hackers, planners and very many people who just preferred to be known by their first names – opened up many questions. What would it be like to bring information technologists face to face with people who work with other kinds of technologies, for instance scrap merchants, masons or cartographers? What would it feel like to scratch the surface of our consciousness and see if there is something like a collective memory in cities – what do we remember about Rameeza Bee, whose fate at the hands of the police in 1978 infuriated everyone in the city to the point of bringing the entire city to a screeching halt? Do we remember of that day in 1970 when everyone in the city seemed to run helter skelter to save themselves from floods that never actually came ? How did so many people remember exactly what they were doing at the time when the news of Sanjay and Geeta Chopra broke on the airwaves in Delhi ? Did Hyderabad actually have a peculiar sense of humour ? What are its linguistic sources ? What sensibilities animated it ? Is there something like a city DNA ? It was in answer to these and other musings that Do Din was born. To move the fulcrum of technology back into the city, and to make it accessible for different kinds of people from across the city, we sought and found a venue bang in the centre of the city – Vidyaranya High School. To reach deep into our collective memories, we invited elderly people to tell us stories that we could all relate to. To break the barriers to our imagination of the city as an outside spectacle, we organized walks through neighborhoods along with residents. To mark our acknowledgement of the simultaneity that city is we visualized it as a multiplex event – workshops, round tables, story telling sessions, art installations, photo exhibits all happening simultaneously. Lived experience of Chennai, Mumbai, Bangalore, Delhi and Hyderabad came together in many different voices and colours. The event created a sense of belonging for many and organizing it again became a responsibility. By the middle of 2014, we began receiving inquiries from people about plans for the Do Din 2014, we realized that we had triggered something in the city’s imagination. Do Din 2014 again brought together a range of urban experiences and renewed our commitments. The year after that we were just not able to pull together the event again, but here we are again at the end of 2016.
Who is Do Din for ? The event itself belongs to the public, to the city although HUL does have certain privileges. Hyderabad Urban Lab feels a strong sense of ownership towards Do Din. But it is not a proprietory ownership. It is the kind that a curator feels towards the assemblage that is put together by the artists. It is the kind that a custodian feels – a matter of trust. For Hyderabad Urban Lab, Do Din is an occasion to renew our faith, reassess ourselves and find new directions in our work even as we recognise our limitations and the constraints we work with. What is Do Din 2016 all about ? Each Do Din is slightly different from the previous ones. This year, we note that there is an overwhelming sense of exhaustion, weariness, and uneasy watchfulness all around us. As we approach the end of the year, many of us seem to feel that the world in 2017 is going to be significantly different from what it was when we began this year – geo-politically, locally and nationally. We need to reflect on all this at Do Din. But we want to anchor that reflection in a broader theme of well-being. What does it mean to think about well-being – for human life, for nonhuman life when the very conditions and infrastructures that made well-being and collective life possible seem to be wearing thin – coming off at the edges ? How should we think about ourselves ? What moral orientations do we need ? What technologies do we need to create ? What renewed commitments do we need to make to ourselves ? What exactly will be happening at Do Din 2016 ? Hope the Do Din will bring technological solutions to urban problems to lime light.